There are many methods used to remove impurities and contaminants from water. Each of the water purification technologies is best at removing one type of contaminant from water, and may not be effective at all for others. Fact: People drawing water from private wells are responsible for assuring that their water is safe for consumption. Fact: The Environmental Protection Agency only requires testing of municipal water sources for about 80 of more than 75,000 known contaminants. Fact: The standards for safe drinking water are safe for a 175 pound healthy adult. Those standards may not be safe for children, pregnant and nursing mothers and adults with compromised immune systems. Fact: Municipal water supplies do not need to test for or eliminate many known contaminants that "do not present a health threat". These "secondary contaminants" DO make your water taste and smell bad, corrode your pipes, stain your sinks and tubs - and may stain your teeth or alter the color of your skin. Below is a short list of common water purification technologies and the contaminants that they remove. Water is passed through activated carbon filter cartridge. Carbon absorbs objectionable odors, flavors, organic compounds, and many hazardous chemicals. Carbon absorption is one of the most widely used water filtration systems. There are two kinds of carbon filter systems - granulated carbon and solid carbon. 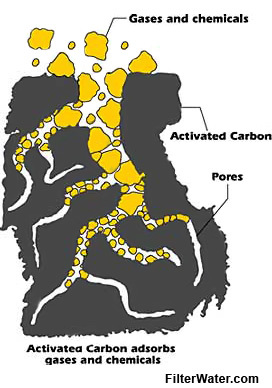 A process of heat treating creates "activated" carbon with microscopic pores and fissures that trap chemical and organic impurities in a process that mimics the filtering properties of the earth. The effectiveness of a carbon filter system depends on many factors, including the type and amount of carbon used, the way the filter is designed and the length of time that the filter has been in use. Hydrogen Sulfide, Radon, Chlorine, Volatile Organic Compounds, Pesticides, Benzene, Colors, Odors. Micro filtration removes sediments and suspended materials from water by passing it through a porous filtering material. They do not remove very fine particles or dissolved substances and are often used before or after other filtration systems. 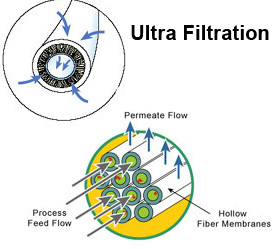 There are three types of mechanical microporous filtration systems: depth, surface and screen filters. Depth filters are often used to pre-treat water by removing up to 98% of the suspended impurities in water that might foul or clog other parts of the filter system. Surface filters remove up to 99.9% of suspended contaminants and may be used as a pre-filter or a final clarifying filter. Screen filters are placed at the end of the filtration system to remove the last remaining traces of resin, carbon and microorganisms. Like Micro-filtration systems, the ultra filtration systems remove impurities from water by passing it through a "screen". The screen in this case is a semi-permeable membrane that effectively separates molecules in water, allowing certain molecules to pass through it while retaining others. May clog. Can be expensive if large amounts of sediment exist. Does not remove dissolved particles. 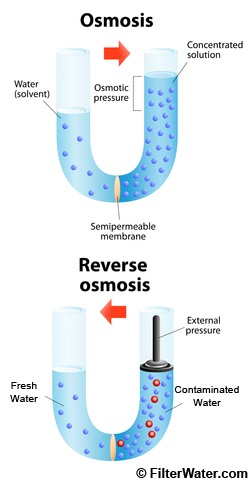 Reverse osmosis works on the same principle as the body's cells - by filtering water through a semi-permeable membrane placed between a concentrated and a dilute solution. The diagram at left should help explain the process. When two solutions with differing concentrations are separated by a semi-permeable membrane, the solution with the higher concentration will infiltrate the solution with the lower concentration. That process may be reversed by applying pressure of some sort to the side that holds the more concentrated solution, forcing it through a membrane that will remove the impurities from the water. The success of reverse osmosis is dependent on the quality of the permeable membrane. Those used in RO water filtration systems are capable of trapping salts, inorganic solutes and many organic compounds. Reverse osmosis delivers high quality drinking and cooking water, but the volume of water needed to produce a usable amount makes it impractical to use for whole-house filtering. It's often combined with other types of water filtration for a complete water filtration solution. Lead, Sulfate, Calcium, Magnesium, Sodium, Potassium, Manganese, Aluminum, Chloride, Nitrate, Fluoride Boron, Most Microorganisms, Organic Chemicals. Requires large volumes of water - it may take as much as 3 to 5 gallons of water to recover 1 gallon of usable water. Flow rate is limited to a certain amount of gallons per day. Water is percolated through a layer of resin beads that have a sodium exchange coating. 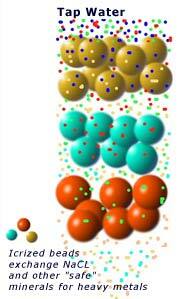 As the water passes through the layer, ions in the water are exchanged for ions on the beads. The method is often used to "soften" water before other treatment methods by removing metals and minerals. It's particularly effective in conjunction with reverse osmosis and carbon filtration. Nitrate, Sulfate, Fluoride, Iron, Magnesium, Calcium, Manganese. Low level ultraviolet light kills bacterial and viral pathogens. The amount of radiation produced is negligible, and it leaves no trace. 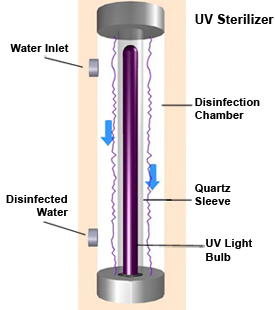 A typical UV sterilizer looks like a stainless cylinder with water inlet on one end, and a water outlet on the other. Water passes through a chamber that has a quartz lamp which performs disinfection. Water is heated to boiling, then cooled to condense the water vapor. Impurities are filtered out by the evaporation, and condensed water is stored and collected in glass-lined container. 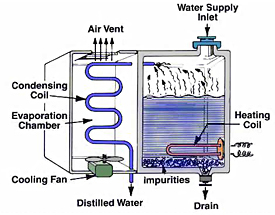 Distillation is one of the oldest methods of removing contaminants from water, but is seldom used for drinking water, as distilled water has little oxygen and tastes "flat"
As the chart above makes obvious, there is not a single water purification method that removes ALL contaminants from drinking and tap water. Most home purification systems will have a number of the above methods to filter out all possible contaminants before delivering fresh, good-tasting, safe water to the tap for cooking and drinking.